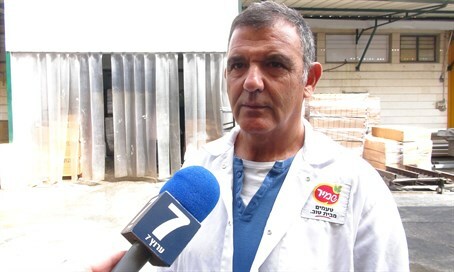 In Barkan, Israelis and Palestinians work together in peace; owner says Palestinian workers will suffer the most from anti-Israel boycotts. The European Union is set to decide whether to label goods produced by Jewish-owned business in Judea and Samaria, in a bid to allow consumers to single out such products for a "limited boycott" of Israel. European officials hope the move will place pressure on Israel to expel Jews living in those areas, as a prelude to establishing a Palestinian Arab state. But Amir Dibon, owner of Shamir Salads in Barkan, Samaria, says those talking about boycotting "settlement goods" don't actually understand the realities on the ground. 140 of his 150 employees are Palestinian, he said, and noted that a boycott of a company such as his would hurt them - and other Palestinians working in Israeli businesses - first and foremost. The Palestinian Authority has few labor laws, which means employees are often mistreated and paid paltry salaries. As a result many Palestinian Arabs struggle to make a living under its corrupt rule - preferring to work at neighboring Israeli-owned businesses. "They support their families with the salaries they get here. They get paid here four times more than they'd get paid in Ramllah or Shechem. It's the only way they can support their families." Many of his employees have worked their entire professional lives at his company, with several now serving in management positions. Those advocating for a boycott "know nothing of what's going on here," he emphasized, noting the cooperation between Israelis and Palestinians that is often unreported. "We've worked together for a long time... for more than 20 years... we work together."